Global Lightning Protection Services is a specialist in research and engineering of solutions into the effects of lightning on mission-critical equipment in the power industry. For exposed structures such as wind turbines, or other tall installations, lightning will strike. The task is to assess the risk of being struck, how frequent lightning damage will occur, and how severely it will impact the safety and the cost of operations and maintenance. Secondly, the cost of performing appropriate countermeasures can be compared with the savings, often making the decision straightforward. Global Lightning performs risk assessments on several levels and works closely with customers to define and describe risk management. The probability of being struck is the first thing to consider, with significant risks identifiable though numerical tools, such as the finite element method (FEM). Strike density data from lightning location networks can be used as input to identify significant risks. Such analysis can be carried out on entire wind farms, oilrigs or other large installations and will identify areas and equipment most exposed to direct strikes of different amplitudes. The impact from lightning current and the associated charge erosion or magnetic fields must be evaluated. This smaller scale analysis is concerned with the behavior of subcomponents, such as wind turbine blade receptors, generators, converters, sensors, and other specific installations. Analysis of the electrical systems within an application such as a wind turbine is used for insulation coordination, where a transient assessment of the installations will define where and which additional protection measures are needed, such as shielding and surge protection devices. Risk analysis and risk management is a key contributing factor to the safe and reliable operation of all mission critical installations. Many industry standards define risk assessment as a requirement and a natural part of the performance documentation. For modern wind turbines, the need for a robust and working protection system has become mandatory. The consequences of suffering from expensive damages or reduced lifespan on critical components have been experienced in the last couple of decades, with new requirements for proven protection performances subsequently defined. Global Lightning is specialised in lightning protection of wind turbines and is able to provide complete innovative solutions that can meet the requirements of professional operators and comply with the newest industrial standards and guidelines. Our contribution to the wind turbine development process can be different, varying from conceptual studies to detailed design and implementation. This process ensures the wind turbine OEM that the lightning protection system is part of the design from the very beginning, resulting in the lowest possible cost. Lightning protection improvement is another focus area for Global Lightning, where older installations are updated to meet tomorrow’s requirements. The total time for the turbine in service is extended, proving a better return on investment. A Global Lightning concept covers all aspects of the lightning strike. Starting from the lightning attachment process, it defines actual striking points on the wind turbines to the specific current conduction, as well as charge transferring through the down conduction and earthing systems. Our solutions comprise all necessary precautions as lightning attachment points and down conductors, and components for direct effect protection, as well as shielding, cable management and surge protection for indirect effect protection. All our solutions are designed in compliance with IEC61400-24 and can be certified according to GL2010 or IEC 61400-24. 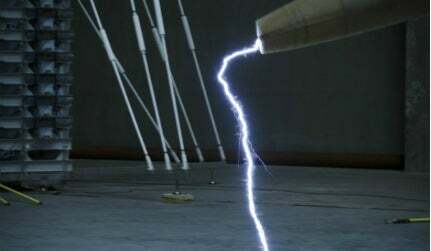 All lightning protection components need to be verified to comply with lightning test standards. Depending on the specific requirements, full-scale testing of subcomponents is most often the preferred method of gaining this verification. Global Lightning operates one of the world’s largest test facilities for direct effects testing, using impulse voltages up to 2.5MV, DC voltages up to 600kV, impulse currents up to 250kA and short circuit currents of 15kA. Test engineers at Global Lightning have throughout the years used this equipment to set up a large variety of tests from small coupons to entire wind turbine blades or nacelles. Global Lightning Protection Services invites you to visit our booth at the AWEA 2013 fair in Chicago, from 5-8 May. This paper discusses the necessity of including lightning protection of wind turbines in the early design phases, to ensure a robust and functional system throughout the lifetime of the turbine.